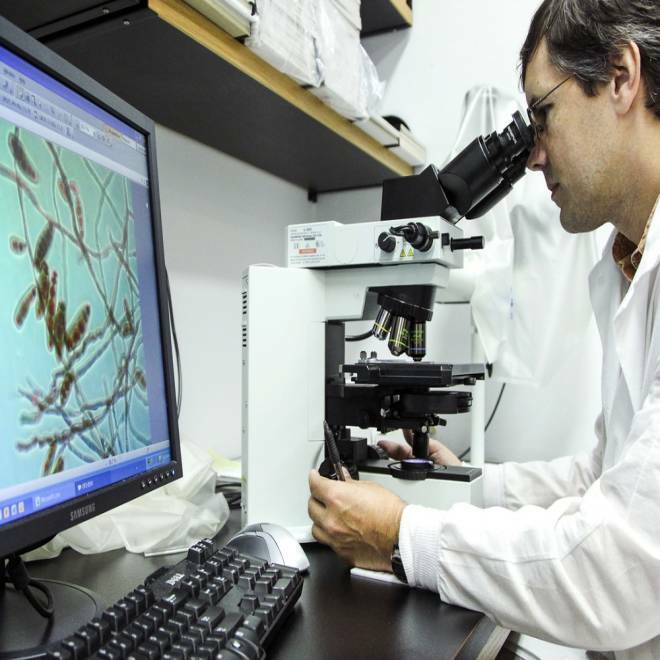 Shawn Lockhart looks at the meningitis-causing fungus Exserohilum rostratum at the mycotic lab at the Centers for Disease Control and Prevention on Oct. 12, 2012 in Atlanta after the fungal meningitis outbreak. The Food and Drug Administration says it doesn’t have the power it needs to control compounding pharmacies that have expanded out of their traditional one-patient-at-a-time role to making mass drugs. But consumer advocates say a recent crackdown by the agency shows it most certainly can – and should. A spate of recent FDA inspections have shown that the dirty conditions that led to an outbreak of fungal meningitis that killed 51 people and sickened more than 700 are anything but rare at pharmacies that mix up what are supposed to be “sterile” injectable drugs. That's a big step up from the previous pace, when FDA might inspect a facility, write a letter, and wait a few years before following up. Hamburg estimates there are more than 7,000 compounding pharmacies in the U.S.
"We had a list of facilities we have been keeping our eye on," says FDA spokeswoman Erica Jefferson. Other FDA reports this year have pointed out patches of rust at one compounding pharmacy in St. Petersburg, Fla. and sloppy sterility practices at one in Swedesboro, N.J. It's about time, say some. “That’s the type of activity we were calling for,” says Dr. Michael Carome of the consumer group Public Citizen, which is agitating for the FDA to do more to regulate compounding pharmacies. Public Citizen has argued that the FDA has all the authority it ever needed to stop rogue compounding pharmacies, but has failed to act. Luckily, so far, there’s not been another outbreak of illness like the one traced to the New England Compounding Center (NECC), in which 51 people have died of fungal meningitis and more than 700 infected after receiving contaminated injection steroids. “We haven’t seen any other large-scale scale compounding outbreaks,” Dr. Michael Bell, acting director of the division of health care quality promotion at the Centers for Disease Control and Prevention, told NBC News. He says there’s a steady stream of requests from states to check, however. The FDA is openly telling the pharmacies and drug manufacturers it regulates that things have changed since the outbreak tied to NECC. Hamburg was questioned by both House and Senate committees about how the incident could even have happened. Currently, the FDA regulates drug manufacturers, while state boards regulate pharmacies, including compounding pharmacies. But the line between what is a manufacturer and what is a compounding pharmacy can be blurry. Compounding pharmacies are supposed to mix prescriptions one at a time, on a per-patient basis. But there’s so much demand for special formulations that hundreds of these compounders have started large-scale production. Now, they closely resemble drug manufacturers – but without the very strict oversight and long list of sterility requirements that manufacturers must follow. Jefferson says the crackdown hasn't gone entirely smoothly. "We still run into situations where a facility has not cooperated with us," she said. "We might not be able to take samples. They might say, 'No, you can't see this.'" Then FDA has to seek help from state authorities. State officials are also cracking down. But it’s been astute health care professionals who have blown the whistle on the cases of contamination that have been found since the beginning of the year. It was a nurse in Connecticut who earlier this month spotted mold in magnesium sulfate intravenous solution made by New Jersey-based Med Prep Consulting Inc. That pharmacy has since recalled all its products. The firm had received FDA warnings about its sterility practices in 2001 and 2010, agency records showed. While none of the FDA actions have resulted in recalls yet, some of the state responses have. In Massachusetts, the state board of pharmacy shut down Pallimed Solutions Inc. after an inspection turned up unsterile conditions. The company recalled 16 of its sterile compound products Monday. On March 21, the FDA announced that Clinical Specialties, based in Augusta, Ga., was recalling all its products after five people who got eye injections of a cancer drug used to treat a degenerative eye condition got serious eye infections. The FDA had been trying to work cooperatively with pharmacies, in essence making them promise to keep things clean. But not any more, the agency told PharMEDium Services, LLC of Lake Forest, Illinois last month, after giving the pharmacy a pass since at least 2005. “These events have caused the Agency to reexamine its exercise of enforcement discretion with regard to the need for valid, patient-specific prescriptions,” FDA wrote. Hamburg has asked Congress for specific authority to regulate these compounders who make products, from bags of saline solution to morphine injections, on a large scale. “In the absence of such legislation, however, the Agency intends to apply its existing legal authorities,” the FDA added. Hamburg had complained that companies have pushed back against previous FDA attempts to regulate them, creating tangled legal nightmares. Carome agrees it’s possible that the pharmacies have stopped doing that – at least for now. “Companies have seen what can happen when they harm patients because of contaminated products,” he said. NECC has declared bankruptcy and faces hundreds of lawsuits, as well as criminal prosecution. “The fungal meningitis outbreak linked to NECC is a situation that no other company wants to go through,” Carome said. Hamburg wants to create a new tier of regulation to cover large-scale compounders. Public Citizen opposes this idea, saying if they’re acting like manufacturers, they should be regulated as manufacturers. The recent crackdown shows the agency can act and should have acted against NECC, which had a history of squabbles with regulators, he says. “We believe yes, their argument falls flat,” he said. Meanwhile, Bell says the CDC and state officials are still dealing with the fallout from NECC. It has asked doctors to keep a close eye on the 14,000 patients who got injections of steroids from the three contaminated batches shipped out by NECC. “We don’t want anyone to fall through the cracks,” Bell said. Some of the infections are taking months to show up. “One (reason) is the medication that was contaminated was a steroid. They turn off inflammation and hide the symptoms of an infection,” Bell said. But the contamination that’s been found at other pharmacies since would have caused almost immediate symptoms, Bell says. “Within an hour or two (of injection), you are going to turn red. You are going to get signs of inflammation,” he said. And, he says, CDC has not seen an outbreak like this linked to a drug manufacturer that is regulated as a drug manufacturer.